(A) Vessel not under command through accident showing two black balls (each 2 feet diameter) or shapes, vertical. (B) Vessel employed in repairing or laying telegraph cables, not under command showing two red circular shapes, vertical, with white diamond shape between. (C) Vessel proceeding under sail and also under steam or other mechanical power shows one black cone 2 feet in diameter at the base, forward where it can best be seen. (D) Vessel marking a wreck. Can be passed on side showing two green balls. (E) Vessel marking a wreck, two green balls indicate that vessels may pass on either side. (F) Vessel aground in or near a fairway showing three black balls in vertical line. (G) Dredger at work, two black balls, red flag indicating the side on which wires and cables are out and it is unsafe to pass. (H) Fishing vessel at anchor showing basket by day indicating its occupation to an approaching vessel. (I) Fishing vessel at anchor shows basket signal, at the side on which a vessel can pass safely. (J) Seine net-fishing vessel showing basket, black ball, or shape forward and black cone at the mizen yard-arm on the side from which the net is being worked. (K) Vessel navigating astern flies two black balls on main mast at either end of yard-arm. (L) Unofficial signal carried in liners showing black ball on either side of mainmast, or a special mast, indicating movements of the rudder to port or starboard. (1) Steam vessel under way shows two masthead and port and starboard side lights. (2) Steam vessel towing another vessel shows two masthead lights vertical, also port and starboard lights. There are three white lights when the tow rope is over 600 feet long. (3) Vessel not under command through accident, if not making way through the water, shows two red lights vertical. 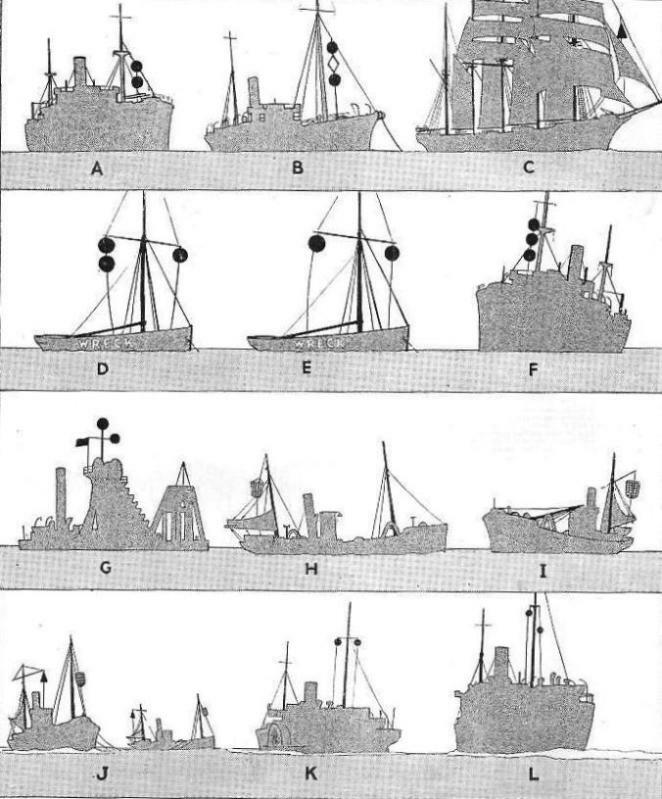 (4) Vessel employed repairing or laying telegraph cables shows red, white and red lights vertical; and port and starboard lights when making way through the water. (5) Pilot vessel on station shows a bright light at masthead, and flare-up light at short intervals of not over fifteen minutes. (6) Steam trawler under way shows combined lantern - white light ahead, red light on port and green light on starboard side; below, a white light shows all round. (7) Vessel aground in or near a fairway shows two red lights and two anchor lights when 150 feet in length (one anchor light only if under 150 feet). (8) Open boat, fishing gear extending not more than 150 feet, shows all-round white light. When outlying gear extends more than 150 feet, a second white light, 3 feet below, 5 feet horizontally from first light, is shown in direction of gear. Fishing vessel at anchor with gear down shows the same lights, lower in direction of gear. (9) Vessel desiring to attract attention shows flare-up light, or she may use a detonating or other efficient sound signal, in addition to the light she is required to carry. (10) Thames dredger at work; three white lights in a triangle indicate that it is safe to pass her on either side. If one lower light is red it indicates that cables are out and it is safe to pass on the opposite side of the dredger. Anchor lights are carried also. (11) Steam pilot vessel at anchor shows red globular light under the usual masthead light, visible all round, but not the usual side lights. 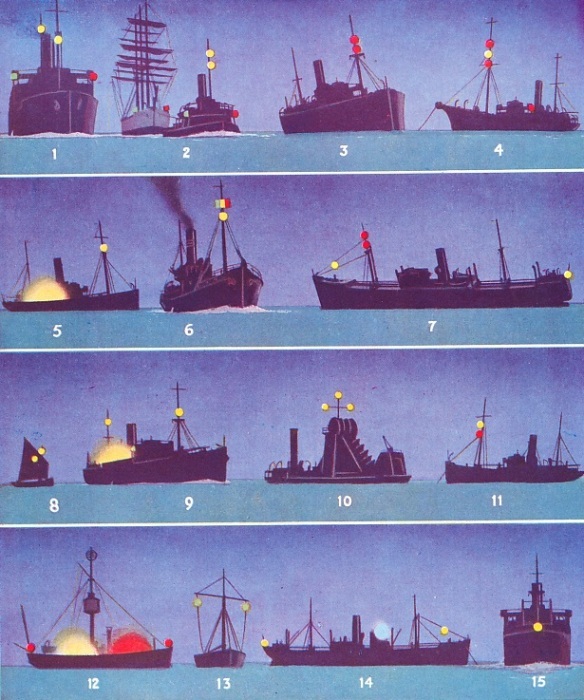 (12) Light vessel out of her proper station shows red light at either end and red and white flare-up lights, shown simultaneously every fifteen minutes. (13) Vessel marking a Thames wreck, shows two green lights, one at either yardarm. (14) Vessel at anchor, exceeding 150 feet in length, shows two globular lights visible all round, the lower of which is aft. When a pilot is required, a blue flare is burnt on the bridge at intervals. (15) Vessel being overtaken shows a white light astern. A flare-up light may be substituted for this white light. You can read more on “Buoys and Beacons”, “Pilots and Their Work” and “Signalling at Sea” on this website.